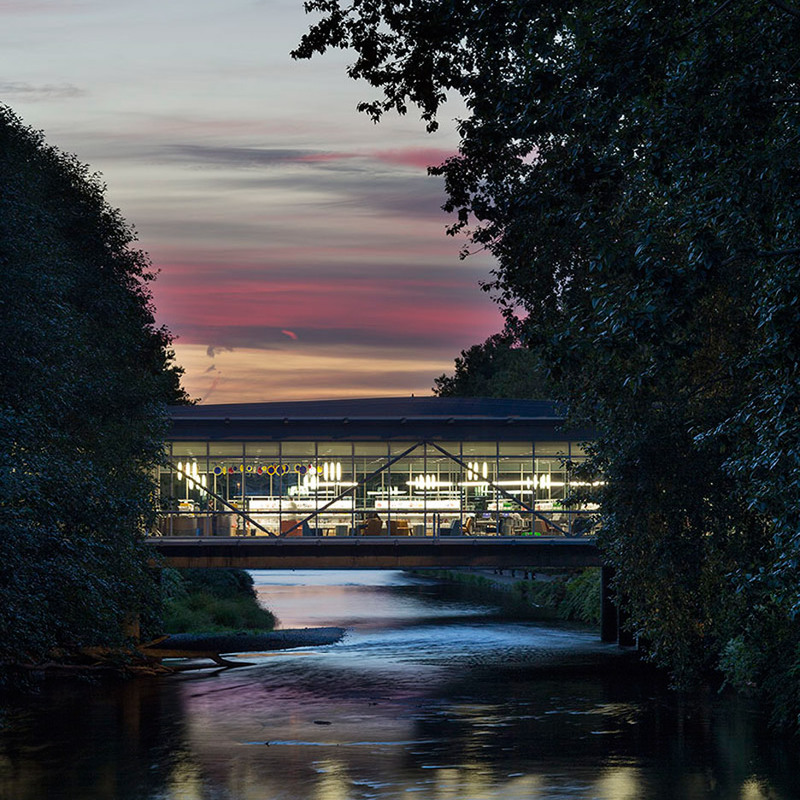 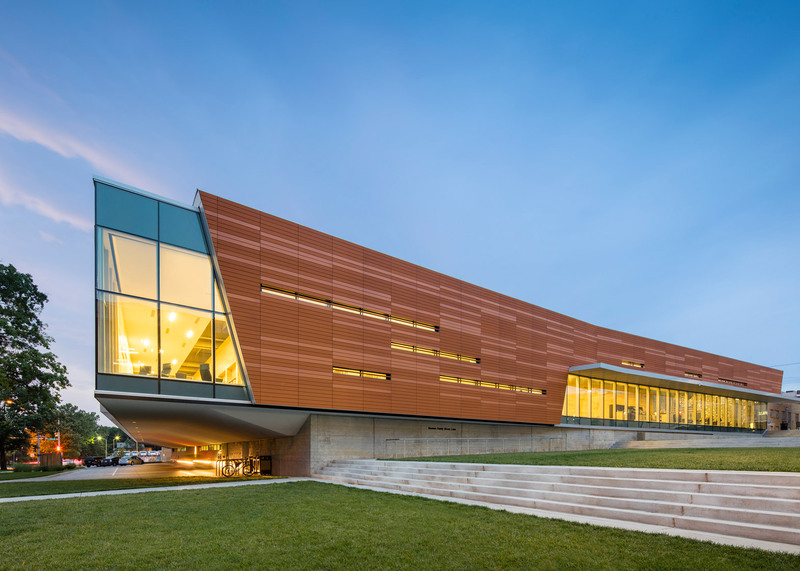 A library that spans a river and a 1970s building wrapped in terracotta panels are among the seven winning projects in the 2016 Library Building Awards from the American Institute of Architects (+ slideshow). 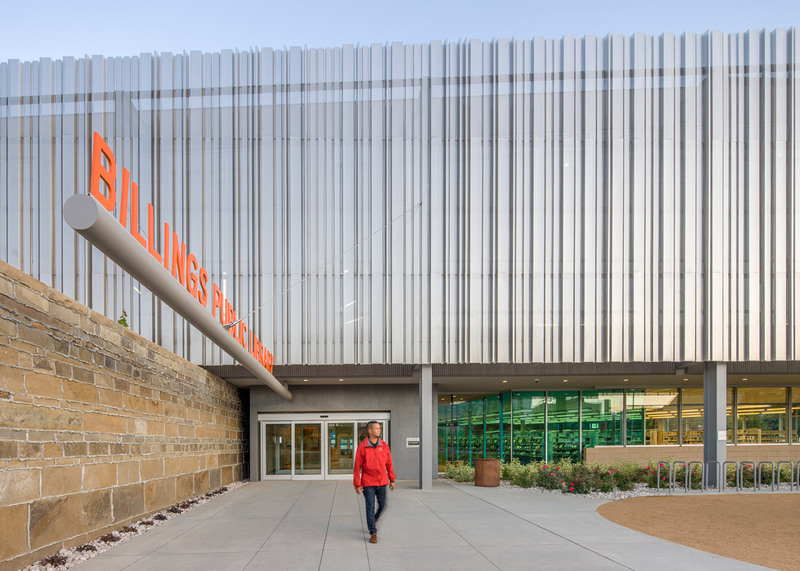 This year's winning projects, which are located in both small towns and major cities, were selected by a jury of industry professionals. 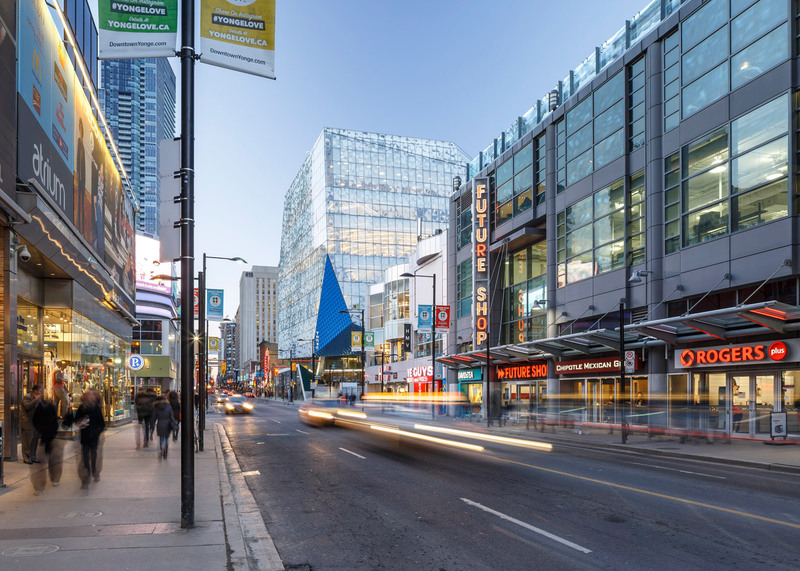 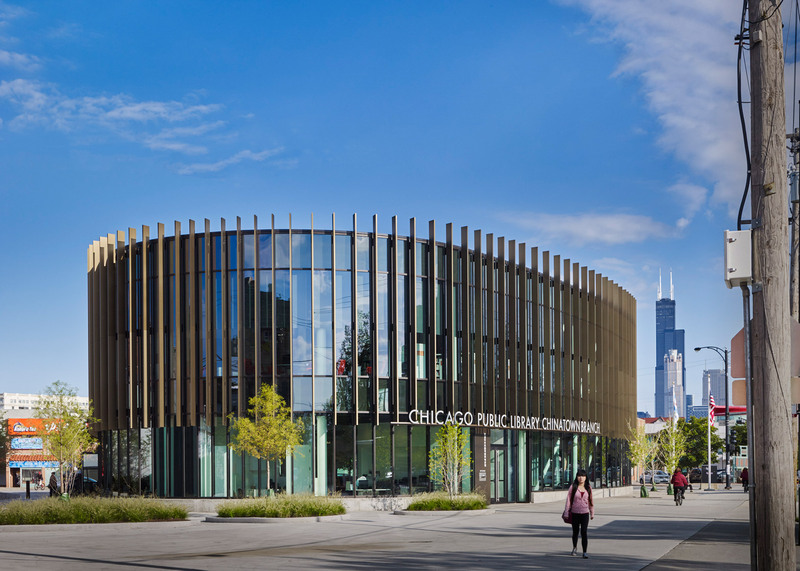 Also among the seven recipients are a curved building in Chicago's Chinatown that incorporates Feng Shui design principles, and a new university facility in Toronto inspired by the historical gathering spaces of Ancient Greece. 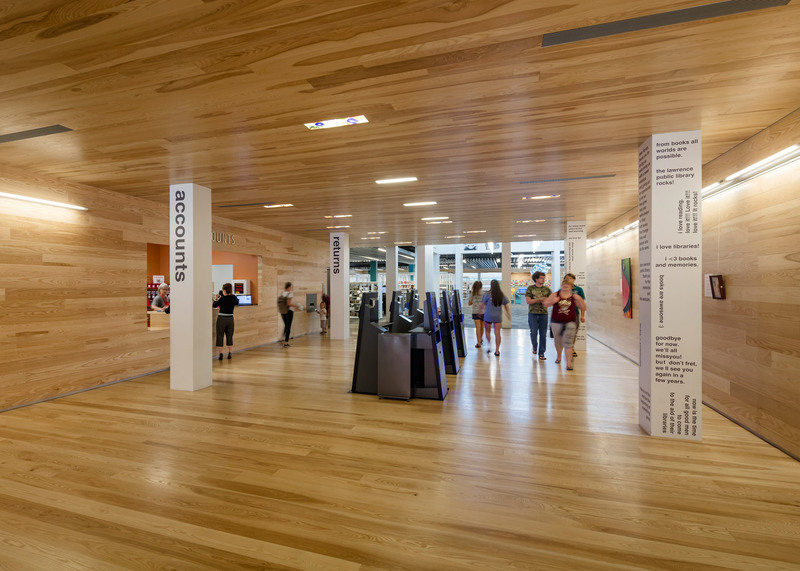 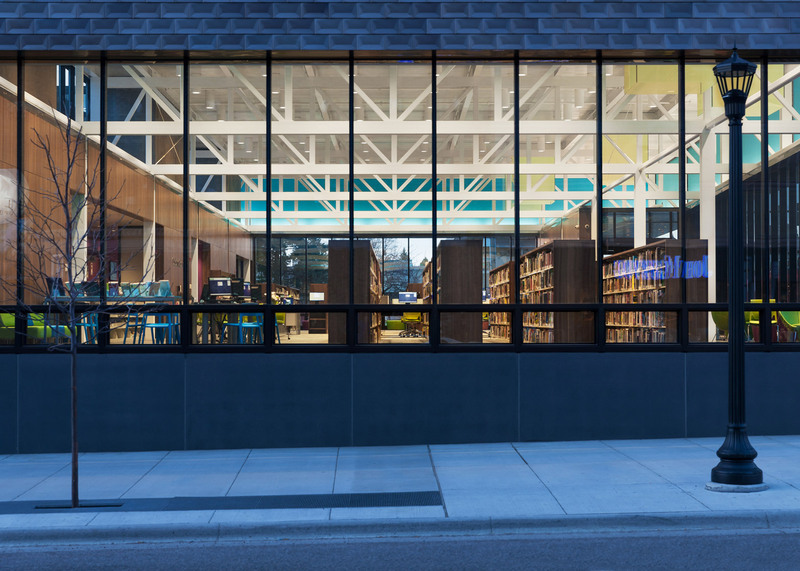 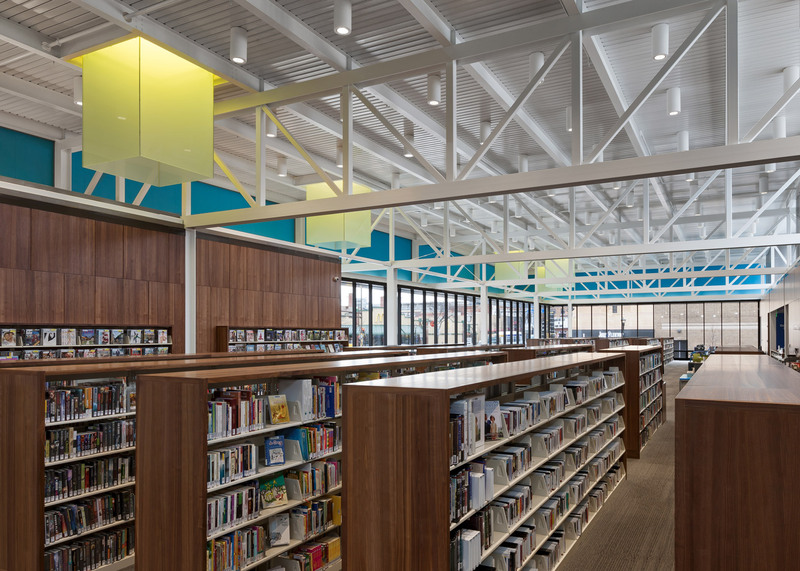 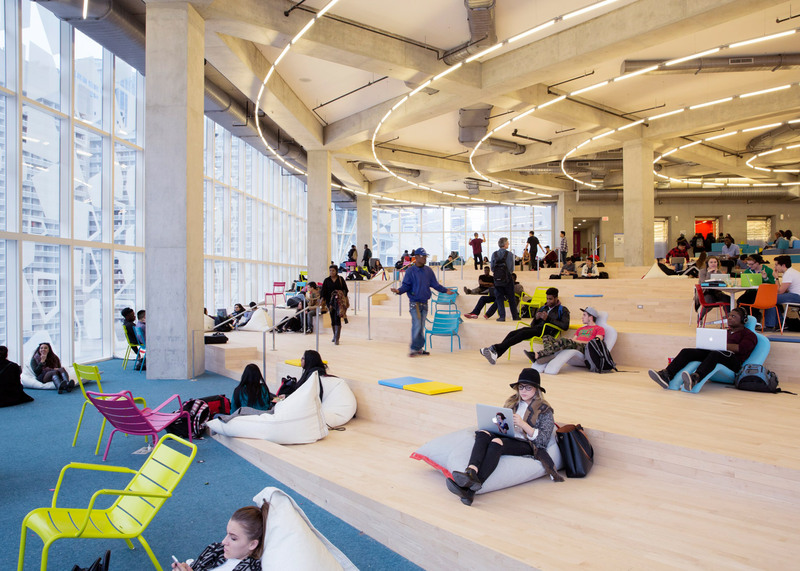 "Libraries are now outward-looking, busy and engaging community places accessible by all," said the jury's chairperson, Lynn Grossman, a vice president at Cannon Design. 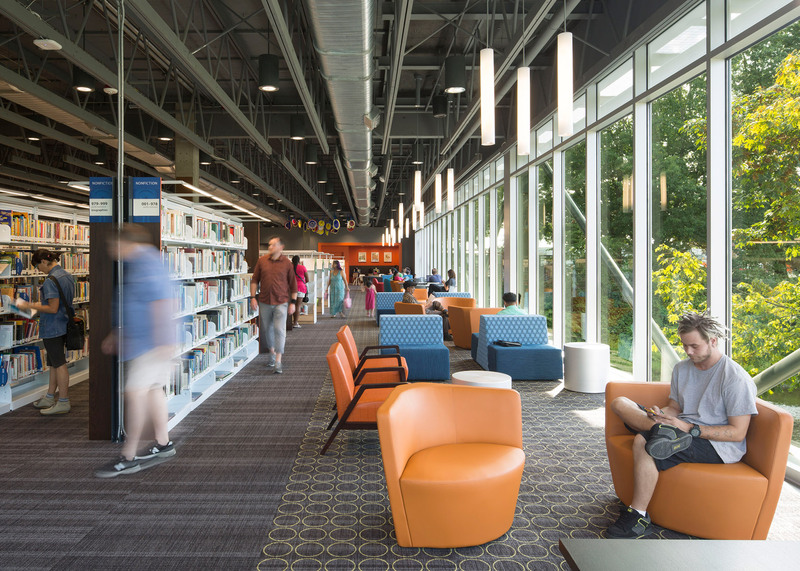 "Books are central to these libraries, but so are meeting and activity spaces, equal access to computers and special study areas." 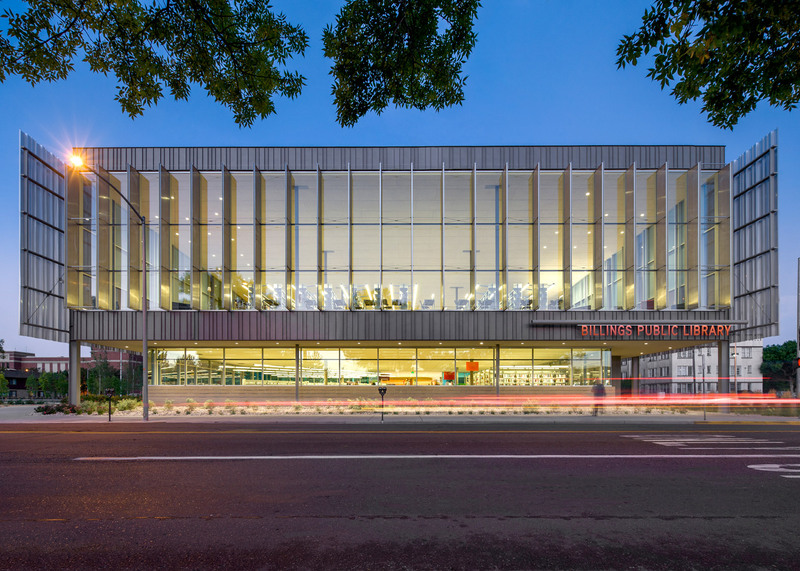 As the only public library serving Montana's largest metropolitan area, Billings Public Library stands in the urban heart of the community. 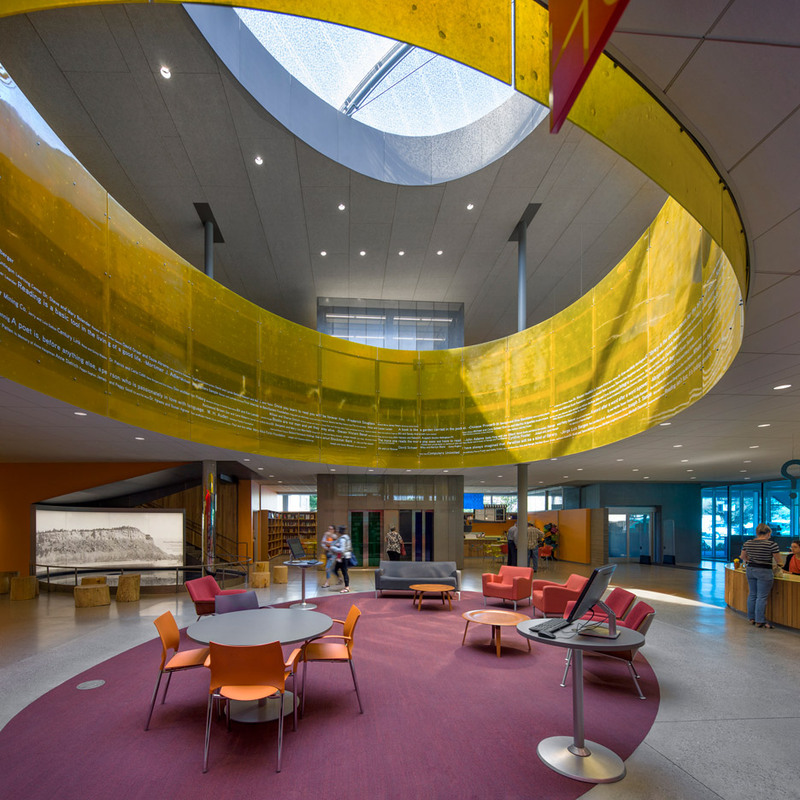 The 66,000-square-foot library (6,130-square- metre) draws from the geologic uniqueness of the surrounding landscape while creating a radiant atmosphere full of natural light. 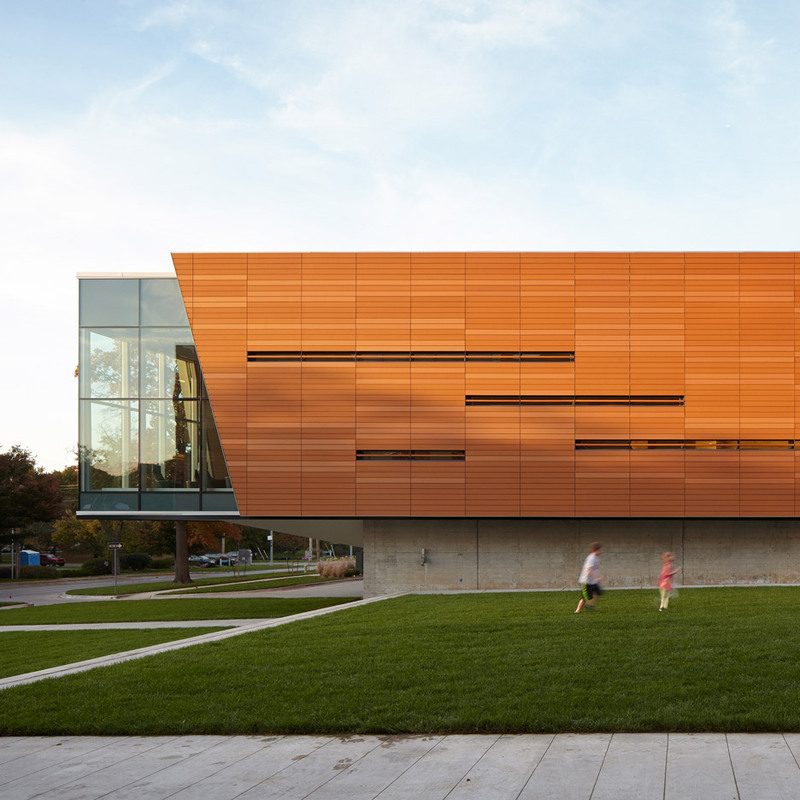 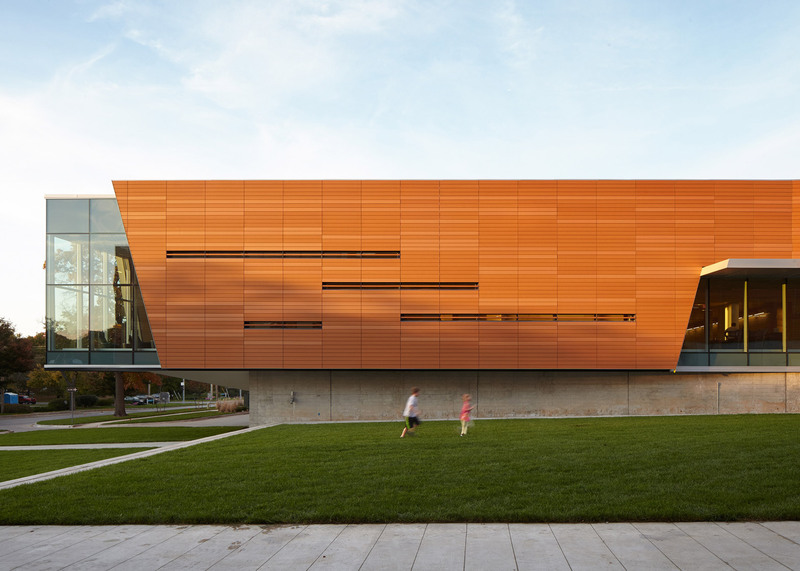 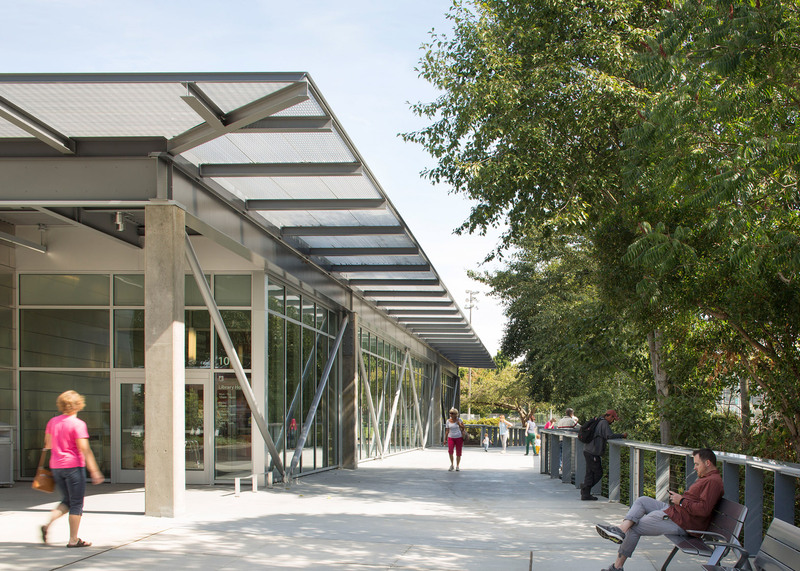 Designed with community input, the library carries sunlight and shadow with unexpected reflections and connects visually to the horizon. 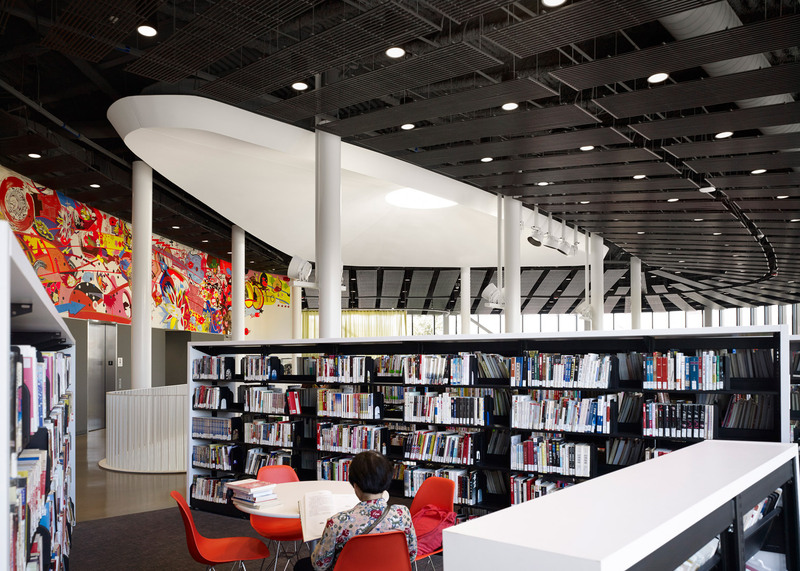 The library is a touchstone of sustainable design practises with its LEED Platinum certification. 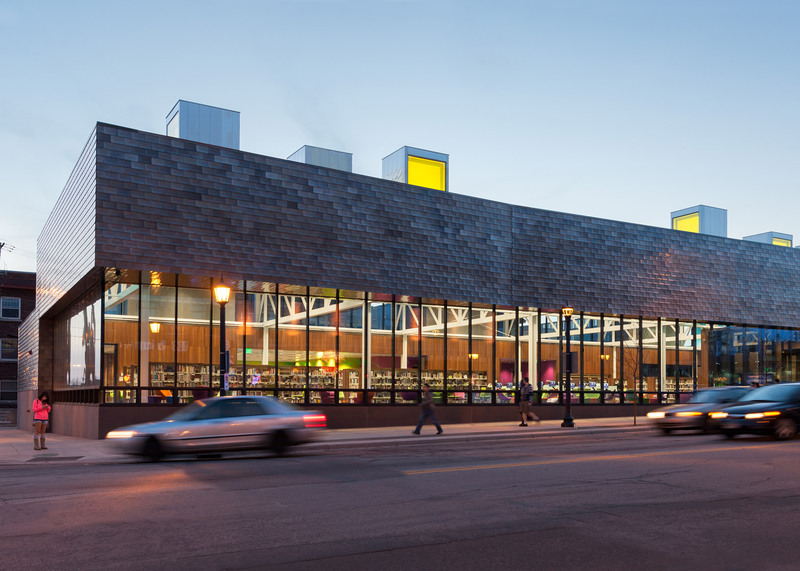 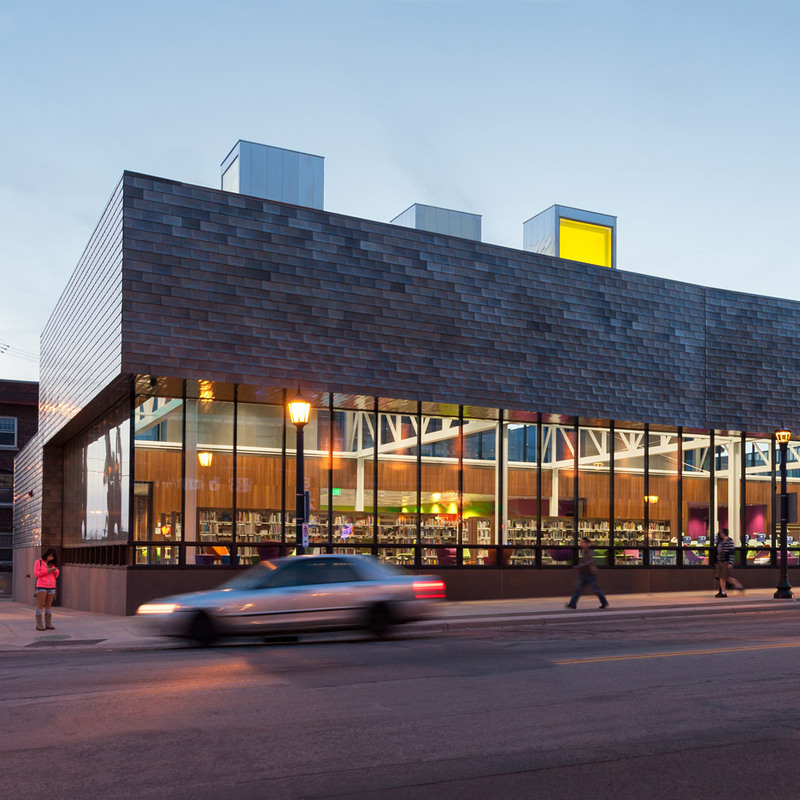 The Chicago Public Library, Chinatown Branch serves as a new civic, educational and social hub for Chicago's Chinatown neighbourhood, providing a public space geared toward community activities and technology-based learning. 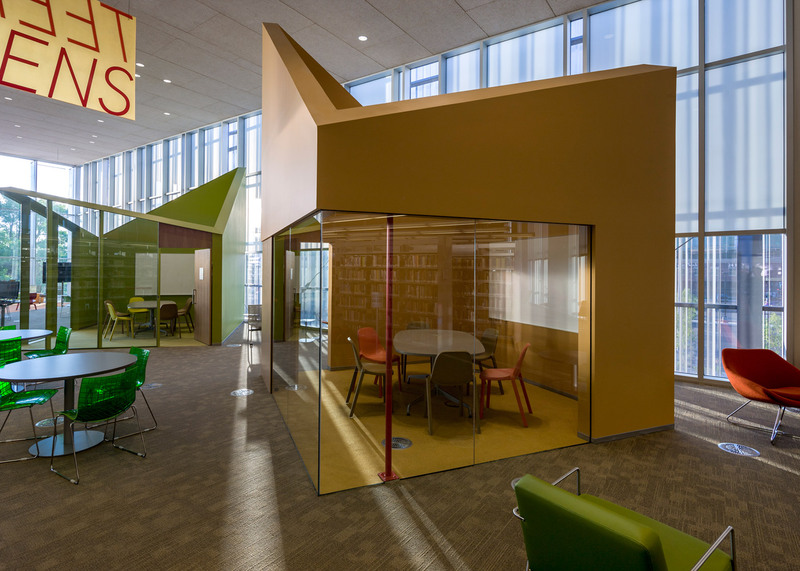 Referencing Feng Shui design principles that resonate with the values held by the community, the library emphasises flexibility and utility. 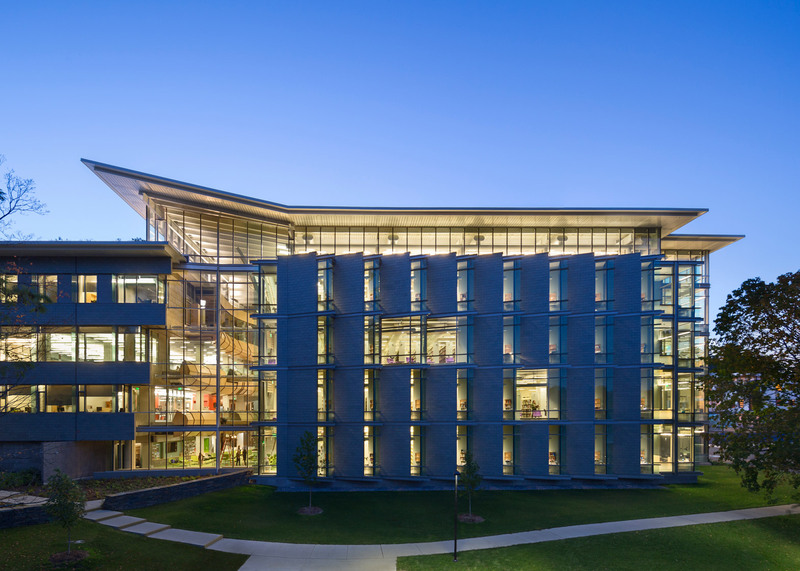 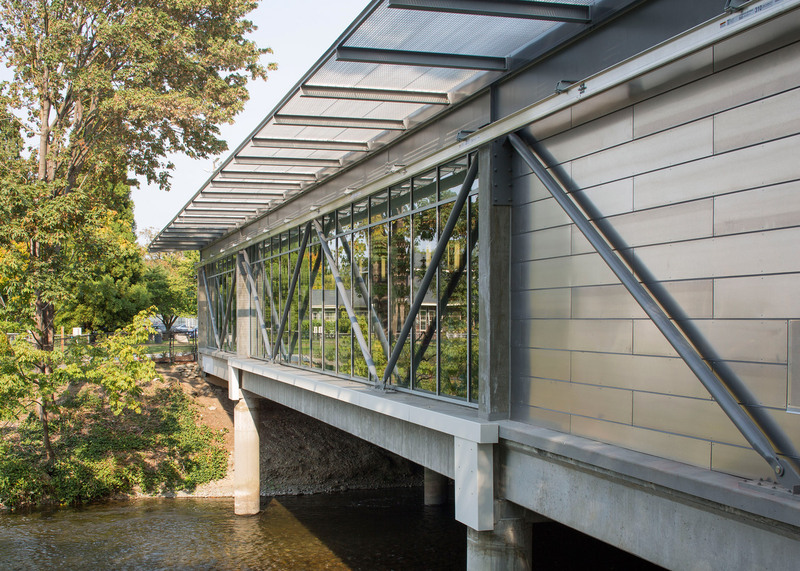 The building is designed to achieve LEED Gold certification and includes a solar shading screen within the building's glass curtain wall, a feature that reduces energy consumption by 30 per cent compared to a typical library. 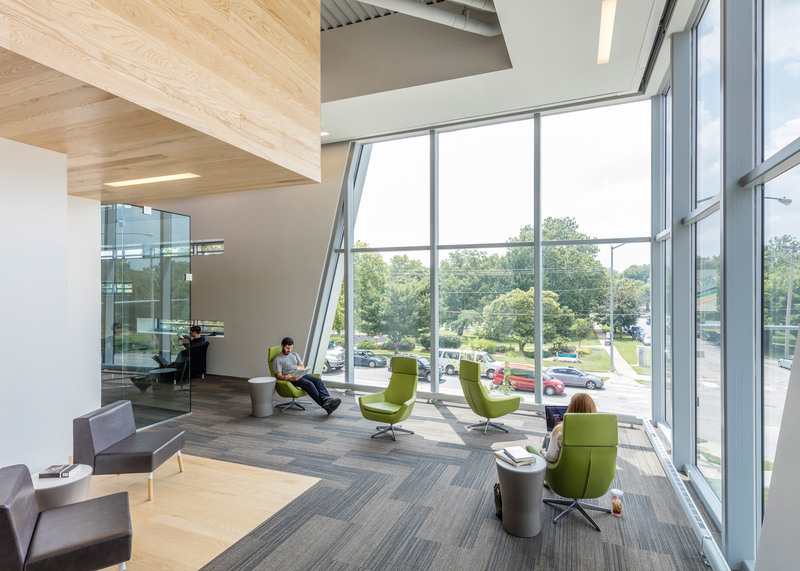 Rooftop light monitors add an informal quality while animating the interior. 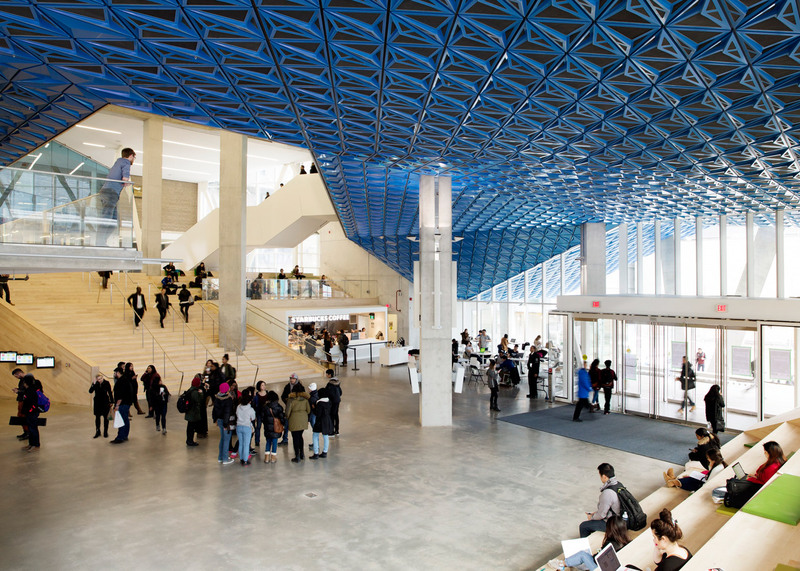 Within a few months of reopening, user visits increased 55 per cent, with youth program attendance up 160 per cent. 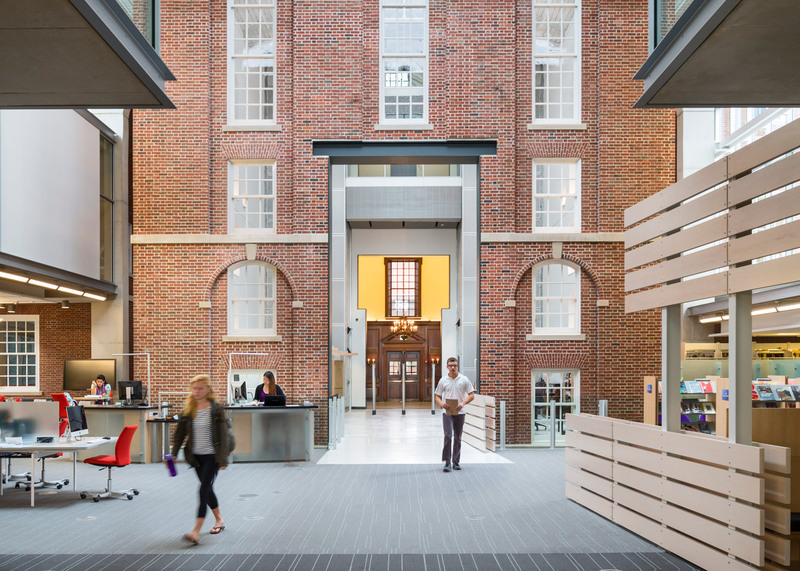 The library's primary facade is the iconic 1921 Stetson Hall, which has been meticulously restored. 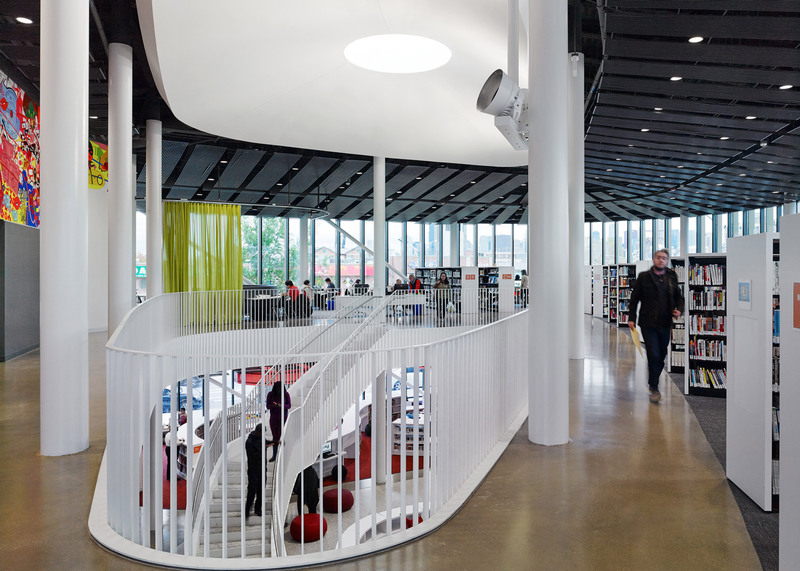 The bright white finish of the materials complement the natural light within the main spaces of the building. 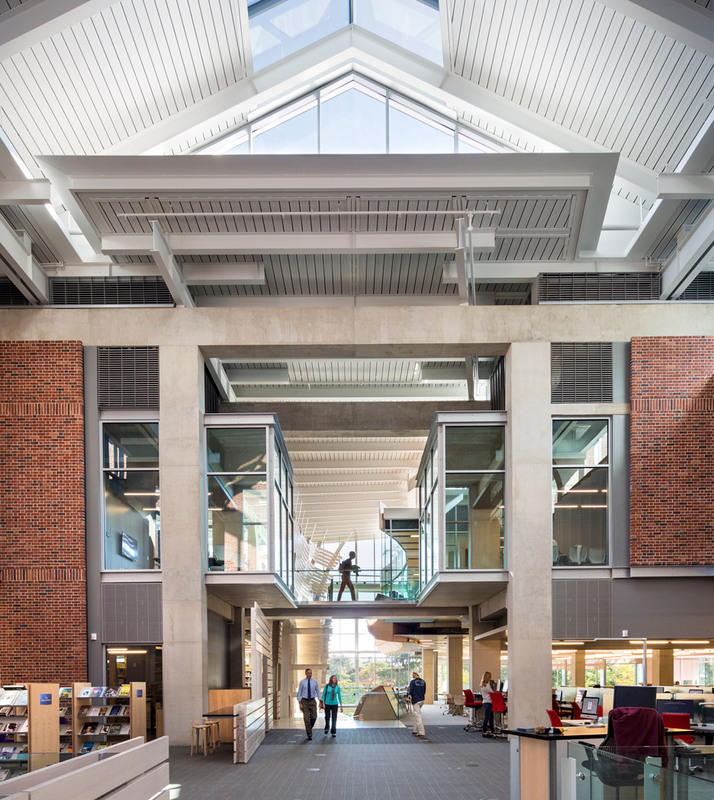 Cascading along a natural slope toward sweeping views of the Berkshire Mountains, the library spaces look outward while also drawing from the atrium's social energy that unifies the building's diverse venues.